The season 2 teaser trailer for Outlander has been released, and it’s got a lot of interesting costume snippets. 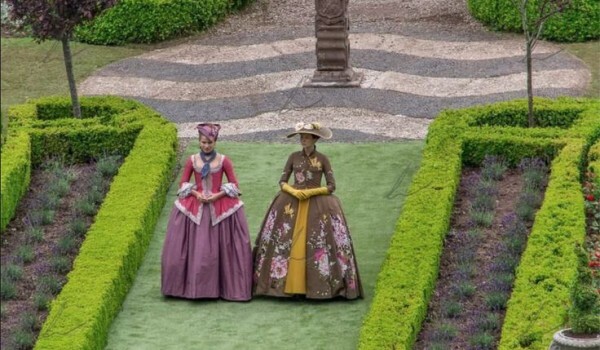 Season 2 is going to be a whole new world — we’re still in the late 1740s, but the main characters head to the French court, which means we’re going from earth-toned wool to peacock-y silks. Let’s take a look at what’s coming up in season 2 (which will probably air in the US in March or April of 2016). So how is a Costume a spoiler? If we carefully orchestrate a Costume for a scene where we need to to tell the human story, stories of pain, joy, loss, whatever, we want you to feel it in the moment. It is designed for that particular moment. It is part of a tapestry, as I have said before, and when you pull out random threads the entire piece is impacted. When a costume is seen outside the context of the story, that thread has been pulled. Are Costumes Part of the Story? So with all that in mind, let’s take a peek at what’s coming up for season 2: France Boogaloo edition! We’re not in Kansas Scotland anymore, Dorothy! This is the first official still from season 2, and it shows Claire in a beautiful yellow silk robe à la anglaise (or française — I’m thinking anglaise because the back looks fitted, which is the main difference). It’s a gorgeous dress — nicely fitted, great materials — although I reserve judgement until I see the back! I like that the painted (?) silk used for the stomacher and petticoat are in a plausibly 18th-century pattern, and I think the black lace edging is a nice touch, although it looks weird to my eye without robings (the pleat that is almost always at each center front edge of the overgown). 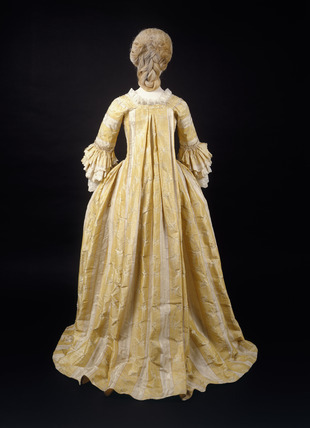 Compare the painted silk to this real 18th-century painted silk dress from the Philadelphia Museum of Art. It’s not the same, but it has a similar layout and feel. I don’t know whose dress this is — I would assume Claire, but you never know. The ruching along the neckline is beautiful, I love the lace sleeve ruffles, and I always approve of bling! Here’s Claire’s famous (to those who have read the books) red dress [NOTE: THIS IS APPARENTLY NOT THE RED DRESS], although who cares when she’s sitting next to Mr. Powdered Spangled Hottie in Yellow? They had me at SPANGLED EMBROIDERY! The man’s wig looks nice, and I like the lady’s dress — the layered color ruched trim is pretty. 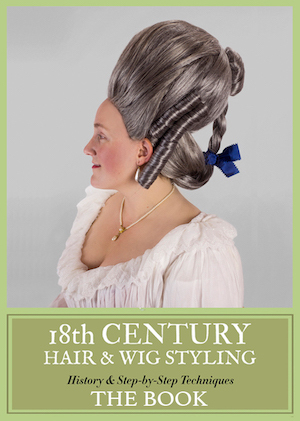 I also appreciate that the ladies are in 1740s-appropriate hairstyles! Jamie’s waistcoat is potentially quite smashing! Clearly I am going to have to resign myself to assuming that they mean any back-lacing gown to be a French court style, even if they don’t get the details right. The fit is lovely, the fabric is gorgeous, I wish it had some trim, and hey, at least they didn’t do metal grommets! Here’s one of the two main dress back options for this era: a robe a la française from the Museum of London. Here’s the other: a robe à l’anglaise from the Museum of London. …and a boned bodice that is almost off the shoulders, with short sleeves (and longer lace sleeves, not pictured, underneath). And a ginormous set of panniers (side hoops). I SO approve of gold lace with that color green. Also, the neck ribbons are pretty, and the hat is a nice shape and has pretty trim! Love the color combination, the fit, and the hat. Don’t love the ruffled-bib cravat. But otherwise it’s really pretty! The effect is very similar to this mid-18th century riding habit at the Victoria & Albert Museum. If only the cravat looked more like these! The Picnic After the Hunt by Lancret, 1741. This could be a Brunswick, a hooded dress, or it could be a hooded cloak. Gorgeous ruching, and I love the matching mitts (fingerless gloves). A Brunswick is basically a robe à la française with longer sleeves and a hood. A pair of 18th-century mitts. That triangular shape on the back of the hand is very typical. 18th or early 19th century, Italy or France – Pair of mitts – Leather, embroidery, Boston Museum of Fine Arts. And a hooded cloak that I was originally thinking was wool, but now I’m thinking satin? A great color on Claire! Here’s a hooded cloak. 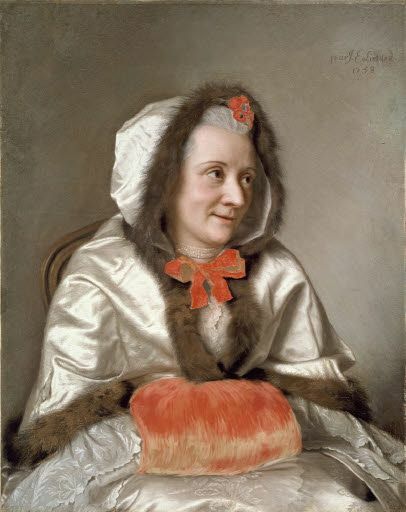 Madame Francois Tronchin by Jean-Etienne Liotard, 1758. That’s right, come closer and give us a spangly kiss Jamie! Lovely and delicate! The waistcoat embroidery, that is. Thank god for spangles, amirite? Close-up embroidery on some gents’ cuffs. 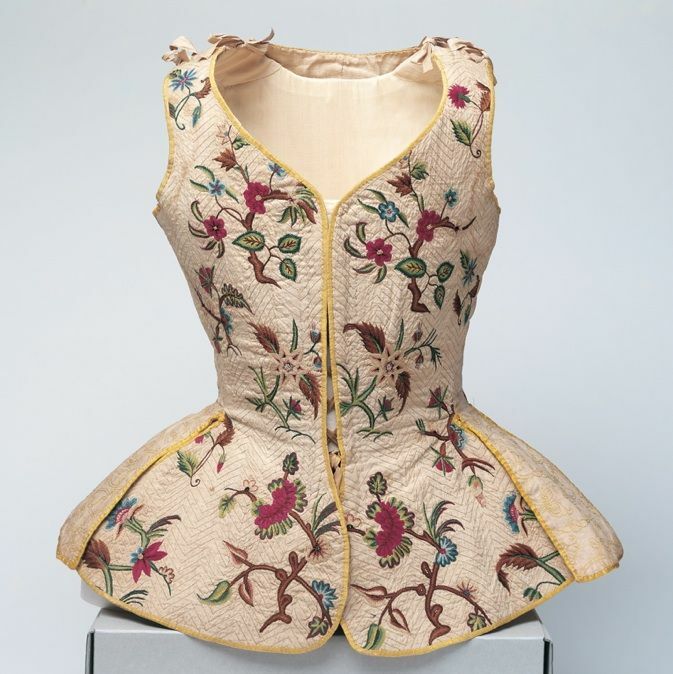 The embroidered buttons are 100% 18th century and FABULOUS. And do I see some hand stitching?? Here’s a surviving 18th-century man’s coat for comparison, with the same style of embroidery on the cuff and buttons. Detail cuff, court coat, 18th century, Whitaker Auctions. A waistcoat? A coat? Part of a woman’s gown? I don’t care, I LOVE acid green. Especially with rose embroidery! 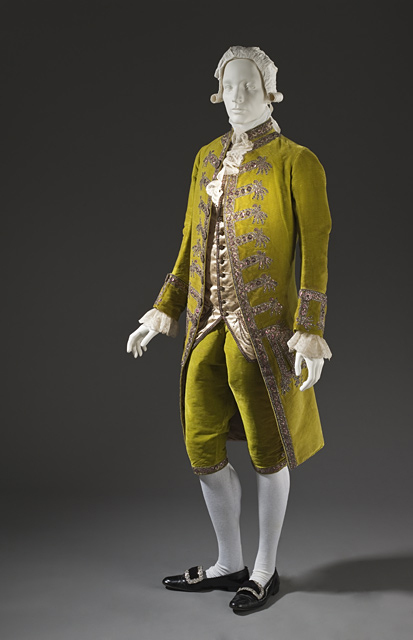 It reminds me of the color of this 1780s man’s suit from the Los Angeles County Museum of Art. It’s beautifully made and fitted! It’s gorgeous colors, especially with the hat and gloves! But that fabric is 1000% 1950s, and not in an un-subtle way. If I squint, I love it! It’s just SO not 18th-century fabric. And the side back lacing is completely random — what, are we in 1540s Florence now? Whatever, we’ll see this on Etsy shortly. 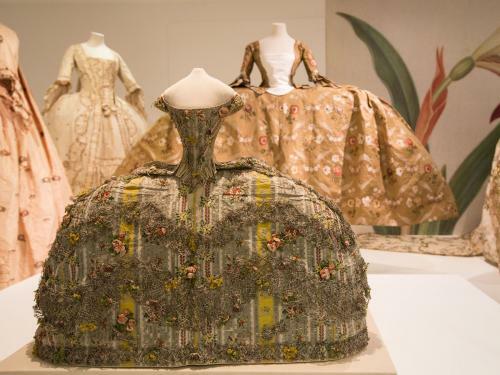 A selection of real 18th-century floral dresses. 1940s-70s dresses with large scale floral prints. 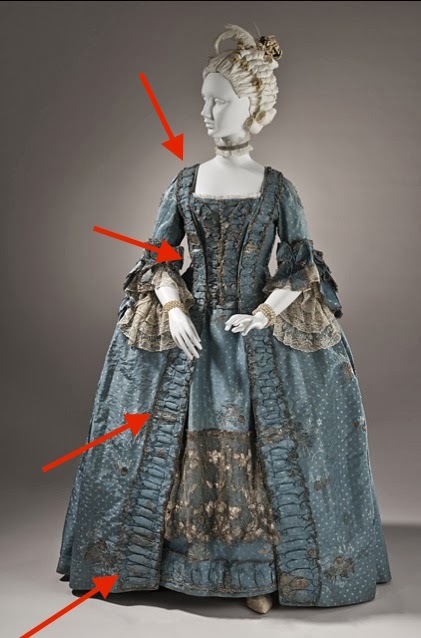 In the the 18th century, a dress like this — with a cross-over bodice (a Turkish reference) and no sleeves/sheer undersleeves — would be worn for a masquerade/fancy dress party, or for posing for a portrait. Will it be worn that way in the series? Allan Ramsay, Portrait of Miss Craigie, 1741. Thomas Hudson, Lady Oxenden, circa 1755-56. Jumps, ca. 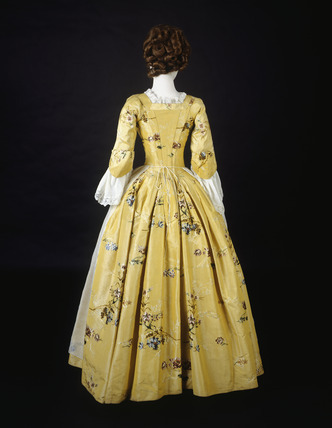 1725; Arizona Costume Institute. Look at all the dapper gents! Love the lady with the parasol on the right! 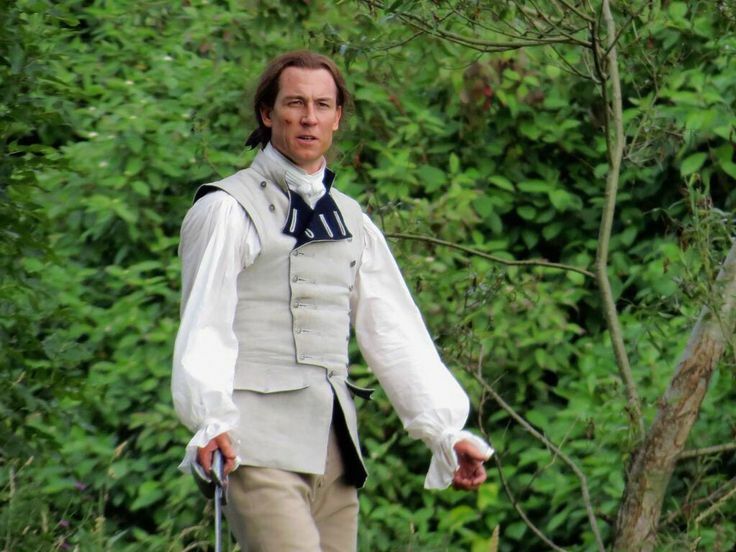 Really nicely done, given what a huge task the Outlander costume department had on their hands. Love that red dress, and there’s Mr. Hot Spangles and the other lady from the photo above, in the upper left. Jamie is looking dapper in the bottom left corner. How excited are you, 1-10, to see these costumes on your screen in the spring? Oh, I have come to love Frock Flicks. I really love being the first to comment. I am very grateful that you began this piece with my Blog post about seeing costumes in context. It is a very important point. ESPECIALLY in S2 of Outlander. Some of the things you are most alarmed about (back lacing aside), were carefully made choices that are story driven. But thank you for a very carefully considered review. Context matters, both in front of and behind the cameras. We had a completely insane task for S2. We ended up making over 10,000 items. We made every single costume. We embroidered the fabric,the buttons, rushed miles and miles of furbelows. Purchased and “adjusted” another 5,000. We worked like dogs. I am too tired to feel much of anything other than glad it’s over, but I am so incredibly proud of my team. I think it is going to be awesome. We should do an interview at some point. I think your posts about just how much work goes into these costumes, and how difficult that is for a TV that’s constantly shooting new episodes, has been really educational. I can’t even IMAGINE taking on that task. I’m very excited to see these costumes play out in the story! And we’d LOVE to do an interview. I’ll send you an email! I think Terry did a spectacular job and every costume was breathtakingly beautiful. I come from a long line of seamstresses in my family, I speak from experience. Terry I applaud you!!!! The costumes are amazing. You all are artists!! 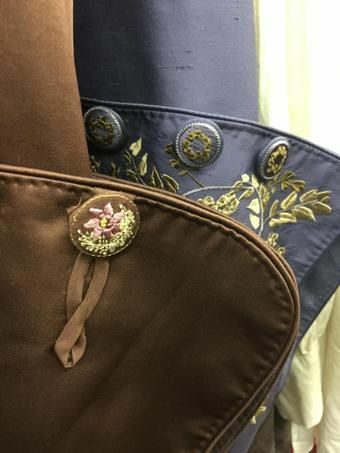 Terry – words can’t even express how much I (and my historical costuming friends) have reveled in the love; care; detail; and back breaking\hand cramping\eyesight ruining detail ya’ll have put into every single thing. I mean..come on: you even did period dye studies* for S1!! The second I saw that (and realized it in the color choices) you had a fan for life (psst: my friends, too, went “OMG that dress! The color!!!! The pleats [cartridge??]!!!! The color! WAAAAAIT!!! That neckline is…is….not period but who cares!!!! She’s there to make a statement and boy did she!! !”) Now we know that it is not *the* red dress. Still…..I applaud you for cutting that bodice so that she felt supported and not a breath away from Janet Jackson! Add to that, that you all get that war (and storyline) is waged in many locations…including the closet (*wink*). Bravo and bravissimo for totally, and without question, knocking it out of the park. My son and I were yelling at the Emmmy’s this year….maaaaan… No worries: we raise a glass to you every week, ma’am! I allow my 14 year old son to watch 90% of Outlander (**with the exception of one and a half heart breaking episodes…but we did talk about it afterwards**). He loves that time period anyways, and he’s slowly seeing that there’s much more to telling a story than just words….and your clothes do make a difference in educating my son on many, many levels. So, thanks. Ms. Frock Flicks: I sadly found out about you, my dear, just today (oh cruel fate: I could have been going “you got that right!” years earlier than I did today!. I tip my Truly Hats ™ to you (look it up!). Thank you for so elegantly and succinctly summing up what we’ve all said to each other and while we’re doing our very best to make magic happen at secret fabric stores around our State. Bless you for one rockin’ site!!!! I wish I was at your college and was able to pepper you with a thousand questions. Lucky students!!! And now….back to boring old Houston, Texas…..no randy Highlanders here. Bummer. But that’s not THE red dress, is it Terry? I’ll be we won’t see that until the episode airs. I don’t think so, Rox. I saw a tweet one time from Terry about it. EP Maril Davis has firmly stated that THE red dress has yet to be seen. The dress shown here is burgundy. Thanks for the info! I updated the post to note that this ISN’T “the” red dress. “The” red dress has an insert or panel down the front in white charmeuse (I presume that’s a sheer fabric). It’s all in the book. Charmeuse isn’t terribly sheer, but it is lightweight. So excited to see the pay off of all this hard work and how these costumes fit into what is surely to be a great second season! What a wonderful article….I love the depth of your research. You should know that Terry has said emphatically that that’s not THE red dress though….its not even red but i’ll definitely be reading you again …Thank you. On a scale of 1-10 – a 15. Terry’s team hit the ball out of the park. Stunning work. Cannot wait to see when season begins! That’s not The Red Dress! We won’t see that until the episode airs. SO proud of Terry and the whole team! One thing I absolutely love about Outlander the Show is the epic richness of it. The scenery, the costumes, the sets all feel very much like golden-age Hollywood. I feel as if I’m watching a sister to The Sound of Music or Ben Hur. At the same time Outlander’s insistence on sticking to history over arches all. Thanks to Terry and her team, S2 looks like an absolute jewel-box that I can’t wait to open. love how my image is the lead image for this post. I’m at a 100! Everything looks gorgy. Well, not the brown 1950s dress, but you go with what you can dredge up within budget constraints. Love the yellow gown. Have appropriated for my Twitter account. Wish is was peacock or teal, tho. “dredge up” the brown dress. It was very carefully and intentionally designed and made. I’m eager to find out how it works in the story! I LOVE that “50’s” brown dress!!! Reexamining the brown printed dress in the pictures given, it looks really good especially in the walking in the ‘park’ ones. I take back my comment about it. Just wait until you see it in the actual show. Everyone has to remember you are all looking at a combination of shots from the trailer, paparazzi and fans. NOTHING in context of the story. Terry – the context is there for those who have read the books and where your attention to detail speaks volumes through your work. Was mighty vexed last year, but if the award shows ignore you again this coming year, may the hounds of hell natter at their collective heels. It would be nice for people not to assume anything in regards to the costumes, as none of us “outsiders” know the reasoning behind each choice of fabric, fit, closure, etc. It’s all about context, and only Ms. Dresbach and her team know all. :) P.S. Kendra, your site and article is amazing. P.P.S. Thank you Ms. Dresbach, and your exceptional staff, for bringing each character to life with each well researched, carefully chosen, and painstakingly constructed costume. The only think I ask is that costumes are viewed in context. First of all when a story is presented in it’s entirety, playing one of many parts in the telling. Secondly within the realities of a television production, both logistically and creatively. Even then, I have no problem with anyone absolutely detesting the choices we make. I do have a problem if our choices are attributed to laziness or ignorance. Beyond that, it is all subjective. Having seen many of the costumes pics as they came out, I’ve been totally excited for season two to air. 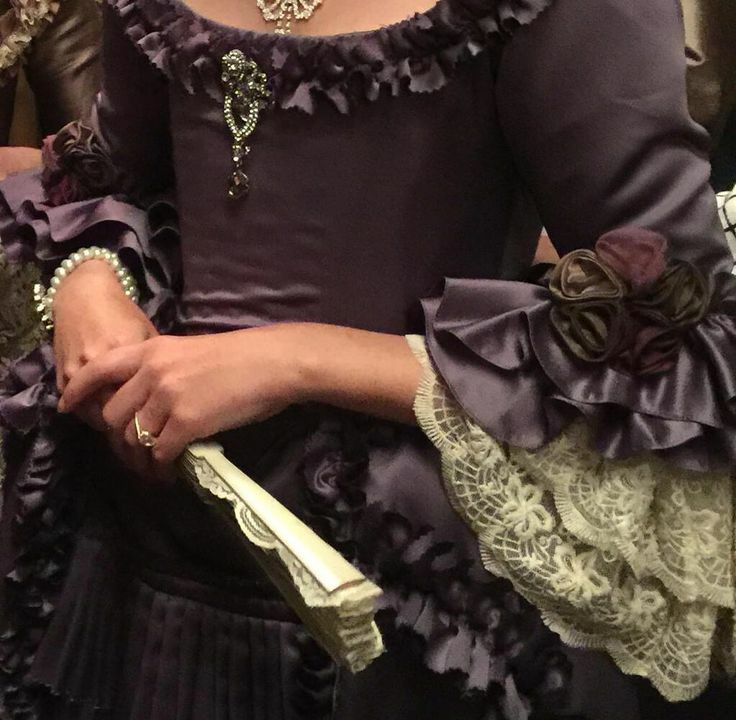 I’m going to say that the “1950”s style fabric is a nod to Claire not being from the 17th century. I think she told her dressmaker what she wanted (and because she was a cutting edge fashionista in her time, right? she would have been all about those giant lovely painted flowers) and the dressmaker in France gave her this! Can hardly wait to see everything in S2. LOVE!!! Good idea, although where would they have found the fabric? Hand-crafted. Either painted those lovely flowers or embroidered them. Delicious! They found the fabric because Gellis, (Claire’s erstwhile witchy friend) who time traveled back from the 1960’s, just happened to have 15 or so yards of “vintage fabric” with her and gave it to Claire as a wedding gift! A theory on the 1950s dress: Claire was a fashionable 1940s gal. Eschewing the impractical and stifling weightiness of 18th-century summer frocks, she designed that dress herself, drawing on trends she saw emerging before she went through the stones. It sets the Paris fashion scene on its ears. Interesting theory, Kim and Elizabet. Mr. Hot Spangles is Stanley Weber, who plays le Comte St. Germain. A hottie and a bad boy?! Bonjour bel homme! The burgundy dress was known to the costume dept. as the “rum raisin” dress, if I’m not mistaken. I must be the only one who LOVES the brown dress. It is a background for the fantastic colors of the flowers. If it had been a brighter color, they wouldn’t show up like they do. Contrast, people. I actually LOVE the brown/flowers fabric. It’s beautiful. I just want it to be a 1950s dress! My guess is that if it is 1950s style fabric design as you say, then it could be that this is a dress Claire herself had some part in designing as she’s originally from the 1940s. The dress might be a story point in of itself. I can say I appreciate beyond words the careful consideration to every detail. I am not an expert, and don’t hold you to the absolute period perfect details, but enough so that I am transformed to another time. And they are absolutely gorgeous!!! I loved and appreciated Season one with all the muted wools and beautiful knits. Besides Jamie and Claire, the costumes are my favorite part! Eye candy, each one. Thank you for all your hard work. It matters! And the people with the purse strings must acknowledge their money is well spent. I would give anything to work on that set!!! Can’t wait to see season two! Thank you for a great article; so looking forward to season 2! Terry, I am QUITE curious as to the meaning of the brown floral dress…it is striking! About the lacing being court style, well, a large part of the story takes place at court…. so it may be that back lacings have been deliberately chosen in scenes involving the court. Does anyone know why the panniers became so exaggerated so that they stuck out so far to the sides? Those dresses must have been very difficult to maneuver! I suppose, like Chinese bound feet (which meant they had to be carried everywhere), it was a sign of wealth – they had homes with such large doorways they didn’t need to slide sideways through them. Well, that’s my theory and I’m sticking to it… until a better theory comes along. As I recall, when Hollywood made its Marie Antoinette movie in 1938, the doors on the set had to be rebuilt to accommodate the width of Norma Shearer’s panniers. It’s the same as with any fashion trend — it starts subtle and then frequently goes REALLY BIG. 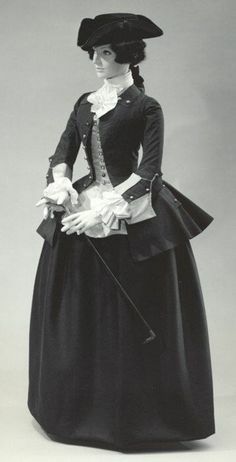 So early in the 18th century, women were wearing round hoops (as they had in the 16th century; the 17th century had a rounded silhouette, but it was more petticoats and pads). Then things started to go a touch toward the sides around the 1730s, then a whole lot more than a touch by the 1740s. Hoops were at their widest by the 1750s, then started getting smaller through the 60s and 70s. Then in the 1780s, a rounded, unhooped silhouette came back. Also, the wide hoops showed off rich fabrics very well! I know it’s not the most HA thing around but God, I really love that 1950s fabric brown gown! it’s like Cate Blanchett’s New Look Evil Stepmother from Cinderella went back in time to the 18th Century. Absolutely gorgeous costumes. I must say seeing some of the conversation here I am now EVEN MORE intrigued now to see how it will all fit together in the context of the storylines, especially the brown dress. it will now be part of the anticipation.. nice. While I am in awe and I greatly appreciate Terry Dresbach’s wonderful work, I have one question: Why is Claire so often put in mousy, dung-brown? It seems to wash out her complexion and I feel it is not as flattering as other colors could be. 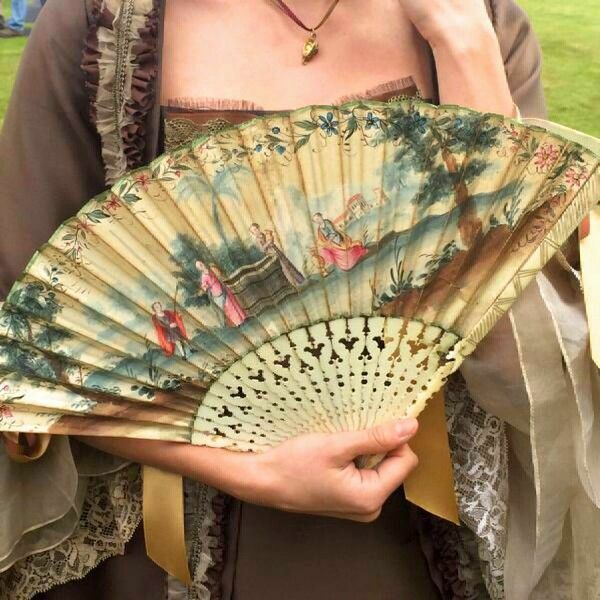 I am hazarding a guess here, but it may be she is following the colours that Diana Gabaldon dresses Claire in. It seems to be in response to Claire’s pale complexion and eye colour. It’s definitely story-driven. Claire is an earthy character, and she’s an herbalist. I don’t think she’d ever choose jewel tones or pastels for herself (even though they’d look gorgeous with her coloring). She’s very much a practical sort. Hi Maddie, I am not trying to choose costumes that are always flattering. My job as a costume designer is to choose colors, fabrics and tones that are right for the story. I have to disagree with you about how Caitriona looks in brown. I have never ever worked with an actress who looks good in every cold, as she does. I love her in brown. You will probably be very happy with her S2 costumes. I am thinking that the brown also ties in with the colors of Scotland’s landscape. That was one of the things that bugged me about Diana’s books. I’d always roll my eyes and think “Another brown dress?! Ugh.” I was so thankful when she wore the red dress because it gave me something else to picture her in. I think Terry’s explanation down below is reaching because she seems to favor either dull colors or the rare jewel tone. I mean look at her 18th century Parisian fashion where people wore mostly lighter colors and we have yet to see one pastel shade even in the extras. Oh I take that back, the Comte’s yellow coat. That’s all. Two of Claire’s dresses have been mostly solid fabric with no embellishments? I don’t know anything about costume design but even I know enough to know that in 18th century Paris her dresses would be a lot fancier than that. And I’m really glad that Kendra pointed out how out of place the brown dress with the huge flowers is. My first thought when I saw it was “Uhhh what? That isn’t how floral prints worked back then.” Of course, Terry has some random explanation for that as well about the context of the story. Yeah ok. And don’t even get me started on the set design which is also too dark for 18th century Paris. Since satin is a weave and not a fibre, I suppose it is possible to create a wool satin. I have seen only two eps of Season 1, but am about to get back into it now that I’ve finished the quite modern True Blood. Not much in the way of costume there, sometimes none at all. But how about some commentary on the Spartacus series? It is, sorry I conflated the two. Wool satin isn’t very common these days, but I have some swatches and they’re gorgeous. Spartacus — some of us (including me) have watched it and it’s good fun. I think the problem is that none of us know much about classical period costume, so it’s hard to review other than “it is/isn’t pretty”! That mid century retro foretelling dress makes me think it’s something Geillis would come up with and wear. The thing with the “backlacing was done with court gowns” excuse is that there the lacing holes went through the lining but not through the fashion fabric, so if you closed the back edge-to-edge, you wouldn’t see any lacing. There is some evidence that a lacing gap (and thus visible lacing) in court gowns might have been part of the design but that makes lacing with visible eyelets still historically incorrect. To be fair, I can’t see anything in that screenshot anyway so I have no idea what has been done there. Now I know I will be long gone before you get to filming Book 8. Thanks for the viewing of these beautiful gowns. The workmanship is amazing! We do not have the correct channel for viewing on television, s000000 I shall be ordering each episode for home viewing! Much, if not all of what I see here in these photos, is within the context of French art and fashion in the 1740s, and it mirrors the unique perspective of Claire within the narrative. The Rococo Art Movement of the early to mid 18th century was largely focused on pastoral elements, some asymmetrical designs, and Oriental influence. Terry’s reflection of these artistic elements is perfectly honed. The blue dress with the puffy sleeves strikes me as purely pastoral, and may possibly be a portrait dress (there is a reference to small watercolor portraits of Jamie and Claire in the books). 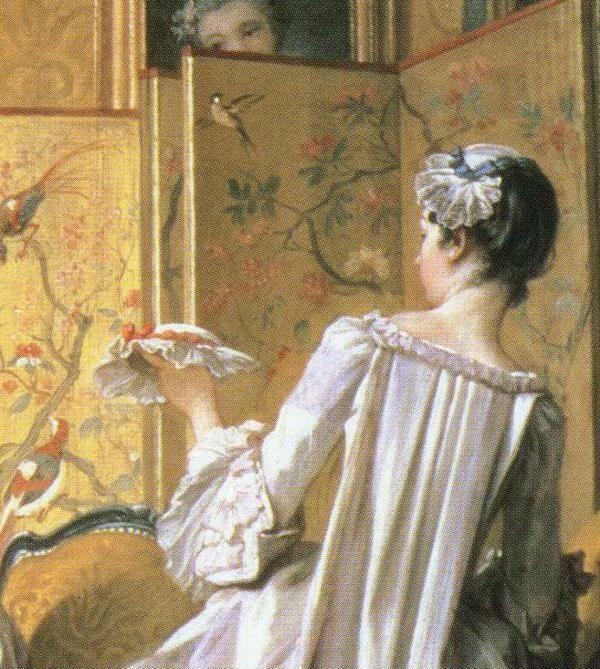 You can see many examples of these dresses in paintings by Jean-Honoré Fragonard and François Boucher. Many portrait artists kept a variety of dresses on hand for such work. I think that the key here is to imagine what Claire’s preferences would have been when she chose her court clothes. Having lived a varied life abroad with her Uncle Lamb, she might be more apt to choose something her peers would not. And that’s why I think Terry states repeatedly to view the costumes within their appropriate context. I think Terry has done a spectacular job and I cannot wait to see Season Two! So many historical dramas don’t feel real, but the stunning costuming, sets, and lighting make it seem as if we’re looking back in time. I appreciate every skilled artisan on this project. 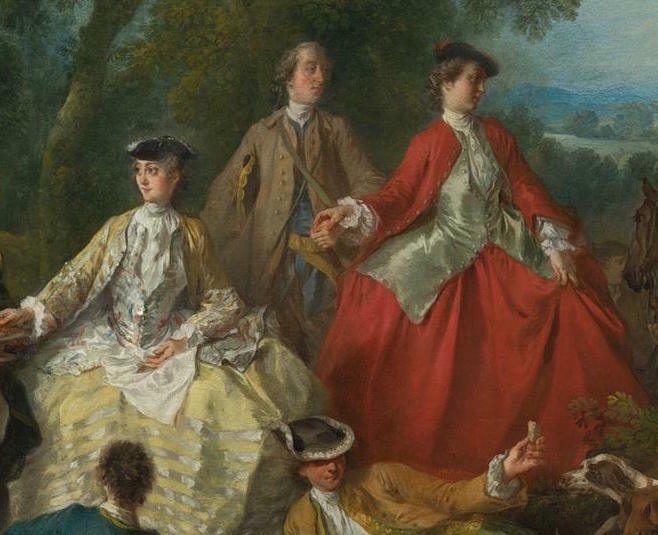 I love the costumes and seeing examples of possible inspirations in this blog from actual 18th century pieces. It is stunning. It is beautiful. Thank you Terry, again, for another incredible season. And thank you, Terry, for Murtaugh. He seems to clean up nice! Bravo. This is totally off topic for this post, but I was wondering if you have seen Masterpiece Theatre’s version of “A Tale of Two Cities” – the lady who was in “Aristocrats” played Lucie Manette and James Wilby played Sydney Carton. Thought I’d mention it since you have the same fascination and love of the 18th century that I do! I probably saw it when I was in junior high, but it is on my list to re-watch and review! Agree with most of your comments! That 50s fabric has been especially grating since it first appeared in set pics, but okay, all the other ones look great, I especially like the riding habit, cravat or not. Terry – These costumes are jaw-dropping beautiful! I bow to you and your staff’s talents, imagination, attention to detail, etc. I cannot even get my head around how much time, labor, love, blood and tears went into the design and construction of these costumes. Clothes, actually. What was it like to wear these dresses and suits every single day back then? Did they realize how exceptional their wardrobes were and how we would drool over them 200 years later? I have loved Outlander for 15 years now, and you have certainly brought that world to life through your costumes and Ron and company’s casting, writing, direction and acting talent. Bravo to one and all. Cannot wait to watch Season 2. And thank you, Kendra, for educating us on the intricacies of the fashions of this time period. I so enjoy reading your comments and analyses. You’re so welcome! Thanks for the nice comment. Terry, your work is breathtakingly 8 stunning! Can’t wait to see the new Season. I love last Season’s wardrobes more than words can tell. You are one talented lady! Thank you! Reading these comments makes me even more excited about season 2. I think Catriona looks great in brown. Ms Dresbach’s use of the many shades of this colour is to be applauded. I love the colour. 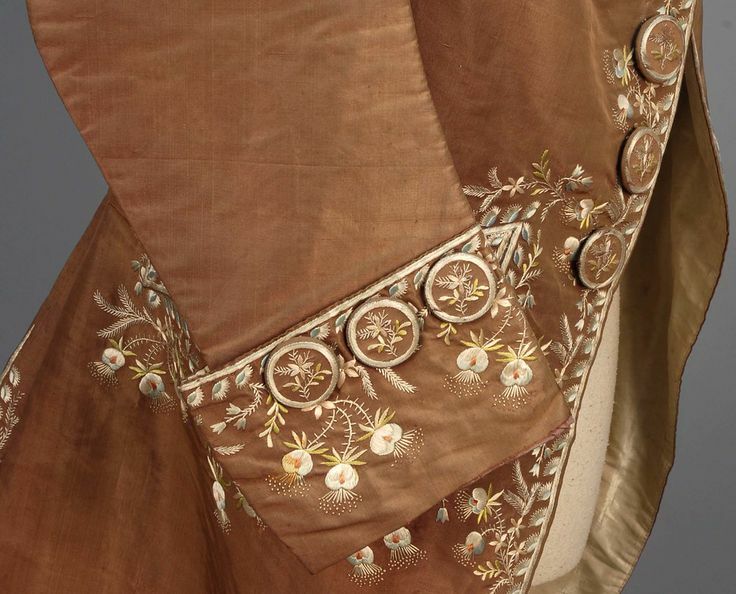 Check out the Met’s dress collection from the 19th century to see the variety of browns. Still it would be nice to see her in a peacock or my favourite teal. Fantastic article. Thank you so much. Breathtaking costumes. Oh to be an extra! Swoon! Everything is gorgeous. I too see an Asian influence in the brown dress, and can’t wait to see how the costumes fit into the story this season. I almost peed my pants!Every single stitch so meticulously crafted. Never an easy to task to take something out of an author, and readers, head and make it tangible. The embroidery is gorgeous! The colors are wonderful! Wait, there are actors in Outlander? All this time I thought it was it was a parade of beautiful costume candy! When my husband retires from the Navy, this is where I want to contribute. He can follow me on location “deployments” lol. There is just something magical about historical clothing and using it to tell a story on such a grand scale. These are the first photos I’m seeing of the costuming for season two. I think they are beautiful! The detailed embroidery is lovely. I love all of the little details. I can’t wait for season 2 to start! I just found your website today and am enjoying reading and learning so much. I have always been fascinated with historical clothing and costuming. I did a report on period fashion my sophomore year of high school and would always buy the historic fashions coloring books at the Shakespeare festival. My dream was to be a costume designer for period pieces but then my practical side kicked in and I was worried about taking such a risk on a career, plus I can’t sew, so I gave it up. I am always so thrilled with period pieces and this blog has reminded me of my passion. I need to learn how to sew! I could at least make myself costumes. Back on topic, I’ve really loved the costuming in Outlander, it’s stunning. I love the portrayals of how they get dressed, I love seeing things like that. Thanks! St. Germain — occultist, alchemist, and, according to one fantasy writer (Chelsea Quinn Yarbro), a vampire. A lot to think about. Costumes look gorgeous, great execution. I’m sure they had Diana “Meat Ax” Gabaldon breathing down their necks… She’s a stickler! I actually want to see this show now! Paul Macdonald posted an article on his FB page about the Outlander crew from “Scotland Now” (Scotland Now.Daily Record.Co.UK) about the fact that they continued shooting on one of the worst days of the Scottish winter. Worth a look. Wow! That is RED! A crimson, I would call it. Gorgeous colour. Were Jamie and Claire able to afford their luxurious wardrobe, via his cousin the wine merchant? While I understand the constraints re time, budget, plot, weather, I don’t understand why we see so little neckline *finishing* in these costumes. Where are the lace or fine linen tuckers/neckhandkerchiefs? Those wouldn’t be either expensive or time-consuming to construct: gather some lace or fabric, stitch it to an approximate length of twill tape, and tack it , or even pin it, to the underside of the neckline of the gown. Remove and attach to the next garment. Particularly for court wear, display of expensive lace–and it could be very expensive indeed–was de rigeuer for those who could afford it, and it adds a hint of both modesty and tease.